What one eats has a tremendous effect on one’s body and health, and Turkey Foot Ranch Grass Fed Beef is dedicated to provide the highest quality grass-fed meat. 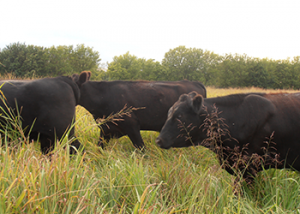 There are a number of significant nutritional and food safety differences between the meats of grass-fed cattle compared to feedlot-raised animals. Below is a summary of the research presented at??EatWild.com. EFA or essential fatty acids such as omega-6 and omega-3 are both needed but in the proper ratio. Feeding grain to cattle nearly eliminates omega-3 while increasing omega-6s, which increases inflammation in the body. However, grass-fed beef is 2 to 4 times higher in omega-3s and lower in omega-6s, lessening inflammation in your body. Also, higher omega-3s lessen your risk of high blood pressure, irregular heartbeats, heart attacks, depression, ADD, Alzheimer’s, cancer, etc. while helping your brain to function optimally. There are other health benefits that research is uncovering. A study published in Nutrition Journal in 2010, conducted by California State University, looked at the fatty acid profiles and antioxidant content of grass-fed and grain-fed meat. Grass-fed beef had elevated levels of carotenoid (a precursor to Vitamin A) and other health benefits.